I've been a bit hesitant to share this, mostly out of one of those pre-emptive fears of opportunities not working out. It's silly and self-defeating and I'm doing my best to move past it. So, in that vein, I'm really excited to share that I was selected to show my work as part of the RAW: Revolution showcase later this month! This will be my first art show since starting painting full-time in the fall, and I'm so thrilled to get a chance to participate and meet other local artists. 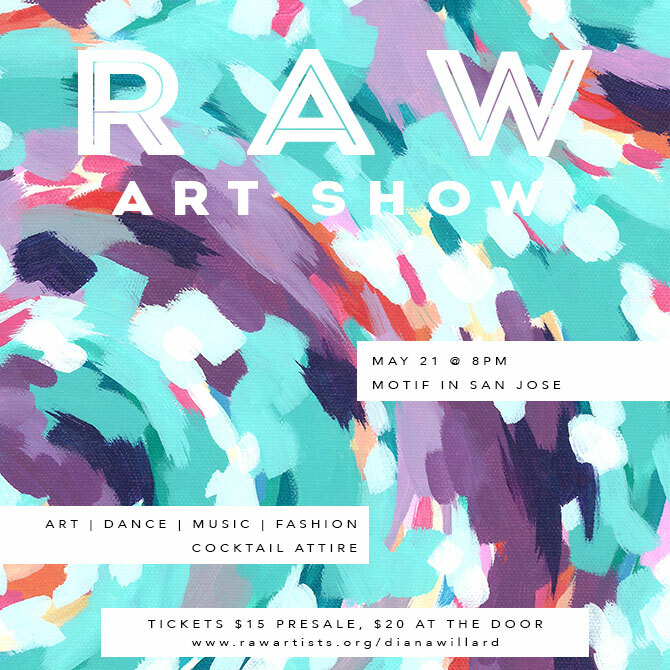 RAW is an organization that promotes artists of all types -- visual artists like myself, dancers, musicians, and fashion designers -- who are just starting out in their careers. I went to the event run-through last week and got to meet some of the other creatives who will be showcasing their work, and let me tell you, they were all super inspiring, talented people. I'm so excited to get to see their work in person at the show! PRESALE TICKETS: Tickets are $15 online via my artist link until next Wednesday, then $20 at the door. Everyone is welcome!